Every other Thursday, Gena Hamshaw of the blog Choosing Raw shares satisfying, flavorful recipes that also happen to be vegan. 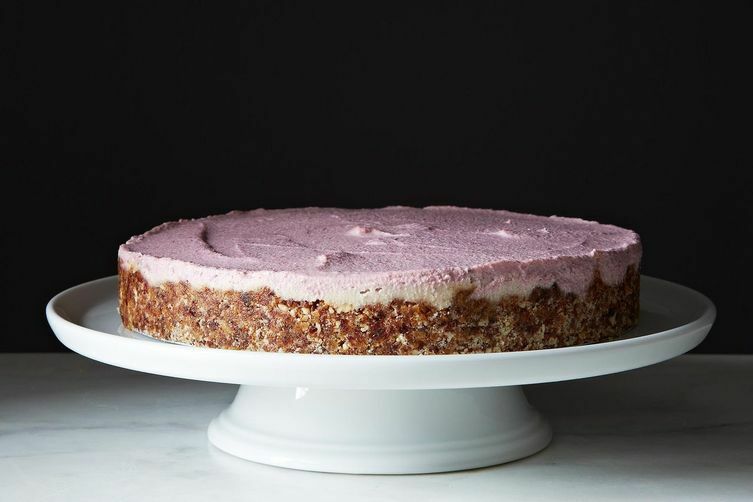 Today: Gena introduces us to the ultimate no-bake dessert: a raw, vegan cashew tart whose appearance alone will convert any skeptics. A few years ago, as I first began to explore the exciting and creative world of raw foods, I realized that incredible things can be done with raw nuts, dried fruits, coconut oil, and vanilla. From cookies, to truffles, to tarts, there’s a way to create a raw, vegan version of almost any beloved sweet. Truth be told, I often enjoy the raw version even more -- if only because I’m impressed with the ingenuity that went into crafting a fabulous dessert without so much as whisking an egg, sifting a cup of flour, or turning on the stove. 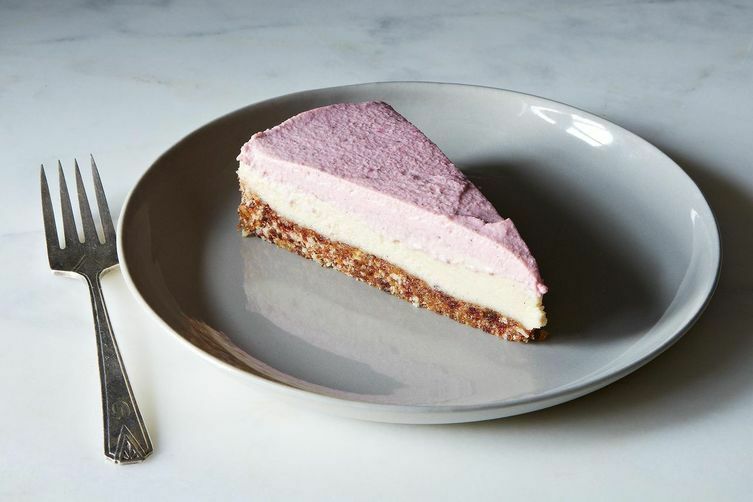 There are a few key tricks to the perfect raw dessert. One is to soak and then blend soft, buttery nuts, like cashews or macadamias, to create a creamy base. Save the crunchier, heartier nuts, like almonds, walnuts, or pecans, for raw pie crusts or crumble toppings. And use coconut oil whenever possible; when blended with dried fruits or nuts, it creates a silky yet firm texture. Be sure to refrigerate your raw dessert before serving, since coconut oil won’t be solid above room temperature. More: Turn raw cashews into a cream that enhances almost any dish, sweet or savory. You can see all of these tricks of the trade on display in the following raw strawberry cheesecake. Cashews, lemon, and coconut oil create a decadent filling, while dates and almonds make up the simple crust. Blend fresh, seasonal berries into half of the filling mixture, and you have a beautiful, impressive, and no-bake dessert -- perfect for days when you can't bear to turn on the oven, and dinner parties where you're looking to impress your guests with a decadent vegan treat. The Food52 Vegan Cookbook is here! With this book from Gena Hamshaw, anyone can learn how to eat more plants (and along the way, how to cook with and love cashew cheese, tofu, and nutritional yeast). Gena Hamshaw is a certified nutritionist, recipe developer, and food blogger. She shares her latest culinary adventures at The Full Helping. She's the author of two cookbooks, Food52 Vegan (2015) and Choosing Raw (2014). She enjoys yoga, sweet potatoes, cashews, and things that are smothered in sauce. Just a heads-up for strict raw foodies: agave nectar is not a raw food, it is made using the same process that creates high fructose corn syrup (per agave manufacturers). Agave does not have a sap of syrup consistency, so it requires heat and processing to get to the gooey stage. It is equivalent to high fructose corn syrup, just made with a different ingredient (often yucca) as the base. If you are not strictly raw, don't worry about it, as agave is very easy to incorporate into a batter, which is a serious pro for raw prep. This looks delicious. Thanks for sharing the recipe, I can't wait to try it. I love that you made the crust out of almonds and dates. I often pair them together on hikes and think they compliment each other well. Absolutely brilliant to use them as a crust! Looks great, but I always find these raw sweets so very heavy on the stomach as they include so much fat... Is there anything to be done about that? Yes, I agree! I've been playing with coconut and also see vegetables. I have a blog (www.realrawkitchen.com) with recipes you might check out because I feel the same about nut-heavy dishes (though a lot of mine do include nuts on some level). Try using coconut meat/butter/oil with bananas if it is easier on your stomach? Also, yes, that is a shameless plug, :) , but I just feel the same as you do about raw recipes relying too heavily on nuts! thanx for this. Will check out your blog with interest. nuts are quite heavy, but also have an issue (maybe more) with coconut oil. I do use it though. But using coconut meat and bananas might be a good alternative! Thanks for sharing, Marquis -- I love your blog! Kitty, I hear you. You can experiment with using banana, as Marquis said (though it won't give you that thick texture) or with using Irish Moss. It has carageenan in it, which is something of a controversial ingredient lately, but if you use it in moderation, it's not likely to have a pernicious effect. You can find it online--it creates a gel texture without added fat. thanks Gena! That means a lot! I've been following your blog for awhile, you're quite an inspiration! Thanx Gena! Great tip. Will try that. Love your blog by the way!! Hi Margie, it is not about skimping. I eat more than enough high calorie stuff. But the coconut oil (not even the nuts) has a bit of a nauseating effect on me. And I was sincerely interested in how I can avoid that. So Gena's answer was very useful for me.